17 October 2008, at 10:59a.m. UK - Forty four years on from historic Khrushchev accolade for Cobb and British poultry industry, writes Roger Ransom, BHR Communications. The VIV Europe 2008 exhibition in Moscow marked a new chapter for Cobb in Russia with the breed's newest distributor Broiler Budushego launching the Cobb Avian 48. But it is 44 years ago this year that Cobb was first introduced to the market in an historic encounter with Russian president, Nikita Khrushchev. 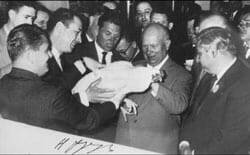 The encounter - depicted in a photograph showing Khrushchev holding a Cobb cockerel - cast new light on the Soviet view of capitalism, as revealed in documents discovered this year. They show that Khrushchev came to regard Cobb as a model for a Soviet poultry breeding institute and the British poultry industry as an example for their own poultry production. This Cobb male bird caught the eye of Russian president Nikita Khrushchev when he visited the British Agricultural Exhibition in Moscow in 1964. One of the joint founders of the UK-based Cobb Breeding Company, Dr John Knowles, is pictured explaining that these Cornish males had 'pea' combs - not the floppy combs that the president had expected of a cockerel. The encounter took place in Moscow at the British Agricultural Exhibition in a pavilion in one corner of a vast showpiece for Soviet enterprise across the present Cosmos Hotel - then known as the Park of Economic Achievement of the People of the USSR from May 18-31 1964. It was the period of the Cold War when East-West relations went through a prolonged series of crises. What initially caught Khrushchev's eye was the small collection of breeding males and females in small cages on the Cobb stand. The birds had been sent from Britain by sea to Russia, and then by rail to Moscow where they were placed in quarantine for one month before the exhibition. Khrushchev, who was reputed to have a lifelong interest in poultry dating back to his early life on a peasant farm near the Ukrainian border, went across to the birds and asked about one particular specimen. Dr John Knowles, one of the founders with Peter Beck of the former Cobb Breeding Company in 1961, explained that it was a Cobb male bird. Khrushchev told him through his interpreter that he was a liar. He said: "Everyone should know that a male chicken has a large floppy comb. This chicken has a comb like a female." Dr Knowles told the Soviet leader that it was a Cobb male bird, explaining that these particular males were pure-bred Cornish stock and had as a breed characteristic 'pea' combs - and not the large floppy straight single combs. At this point, Khrushchev took hold of the male and turned it upside down. He pronounced that Dr Knowles was right and that it was a male. Dr Knowles asked Khrushchev if he would like to receive a trio of Cobb breeders (one male and two females) to which he replied that he would like to raise these birds at his datscha (summer house). Next day, a little man arrived at the Cobb booth with some large cardboard boxes. He stated that he had come to collect the chickens for Khrushchev and that the Soviet leader asked if Cobb could supply a diet plan for feeding the stock, which Dr Knowles provided. In return, the man presented Dr Knowles with a signed photograph of Khrushchev looking at the Cobb male. Dr Knowles, who later became famous for his Marwell Zoo devoted to the conservation of endangered wildlife such as the black rhinoceros, still has the original photograph signed by Khrushchev in fountain pen ink at his home in Hampshire, England. Autographed photographs of Khrushchev are extremely rare, with the only widely known ones showing him with Yuri Gagarin, the Soviet cosmonaut who became the first person in space. However, the Cobb breeding trio never went to Khrushchev's summer house - but to the new primary poultry breeding farm opened four months earlier at Zagorsk, at present Sergiyev Posad, near Moscow. The trio (probably Cobb 100 stock) could well have been the first pedigree broiler breeding stock used in what was then a programme based only on dual-purpose breeds. Poultry were kept as a sideline with few large farms at the time. This all came to light during some extensive research into the events surrounding the encounter by Wim Dekkers, of Cobb Germany, and Dr André Gerrits, a famous Dutch historian specialist in Cold War history at the University of Amsterdam. He contacted the Cold War Museum in Virginia, USA, where the director is Gary Powers Junior, son of the famous American pilot Francis 'Frank' Gary Powers whose U-2 spy plane was shot down while over the Soviet Union, causing the U-2 crisis of 1960. Gary Powers Junior sent the picture to Professor Sergei Khrushchev, son of the Soviet leader, who is a friend and member of the advisory board of the Cold War Museum. Professor Khrushchev works at the Brown University, Providence, Rhode Island, which has a large collection of Soviet archives including Nikita Khrushchev photographs that he donated. Professor Khrushchev started painstakingly searching documents in the archives of his father held at the university's Watson Institute for International Studies. There was no picture of Khrushchev on the Cobb stand, but what he did find was a memorandum relating to the British exhibition, hidden in a dusty box file for 44 years. Professor Khrushchev immediately recognized its curiosity value for the 'poultry folk'’ and sent a photocopy of the memo to Cobb Europe. The document, entitled 'On the management of agriculture in connection with the transition to the path of intensification' and dated July 18 1964, had been sent to members of the presidium of the Central Committee of the Communist Party of the Soviet Union. In the memorandum the Soviet leader extolled the British poultry industry, and particularly Cobb, as examples to follow. He states, "We should learn a lesson from the capitalists. They have come a long way in organising their intensive agricultural production and have achieved great success." He was impressed how much scientists were an integral part of the industry, whereas in the Soviet Union industry was isolated from scientific institutions. He mentioned twice the name of Dr George Clayton whom he met in Moscow. Dr Clayton was a South African who graduated at the University of Edinburgh where his research on the inheritance in the fruit fly (Drosophila melanogaster) is recognised as classical work in the history of genetics. He took on consultancy work for several companies in the poultry industry including the Cobb Breeding Company where he would have worked through the 1960s on lines that were to form the basis of the original Cobb 500. When he retired in around 1980, he moved to Canada to help his brother in pig breeding; he died in 1998. Khrushchev was impressed by the way in which Dr Clayton as an academic and a scientist was working closely with industry - a strategy that seemed alien to the Soviet Union at the time. The Khrushchev paper mentions the Cobb broiler weights and feed conversions shown. Khrushchev was impressed, too, by the detail of the Cobb approach, mentioning a ruler provided for farmers to calculate the quantity of feed which the bird needs depending on its bodyweight, the amount of calories in the feed and the temperature. He called this 'a sign of a high-minded approach to poultry husbandry'. 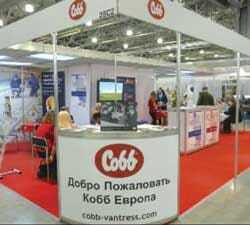 The Cobb stand at VIV Europe 2008, held in Moscow where new distributor Broiler Budushego was featuring the Cobb Avian 48. It is planning to produce 2.5 million parents a year from its new hatchery officially opened in July. Lysenko's theories were grounded in Lamarckism - the concept of the inheritability of acquired traits - and were subsequently discredited, but his ideas on the relevance of science struck a chord with Khrushchev. It seems that the memorandum was also part of Khrushchev's campaign to show the rebellious scientists who was the boss. But he did not survive long afterwards. On October 15 1964, he was removed from power by his party colleagues and one of the main reasons for his fall was ironically his failing agricultural policy. He retired to rural Russia and died in 1971 aged 77. He had perhaps discovered too late the lessons from capitalism.